The pre-frontal cortex, the part of the brain right above our eyes, is responsible for our “higher thinking” – long-term planning, impulse control, deciding whether something is right or wrong. This part is sometimes referred to as the general director or “CEO of the Brain’, as most decisions are made there. The pre-frontal cortex is one of those aspects of the human brain that distinguishes between man and animal. 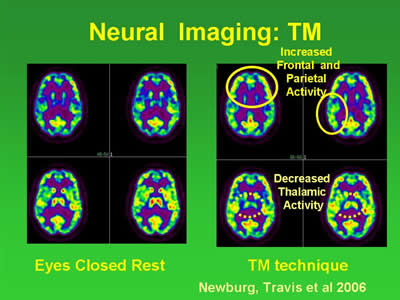 During transcending the frontal brain doesn’t only become activated, but also the coördination with other parts of the brain, disrupted during stress, is restored. This can be measured through EEG coherence measurements – for more info see transcending = full brain development.